The ankle joint is formed where the foot and the leg meet. The ankle, or talocrural joint, is a synovial hinge joint that connects the ends of the tibia and fibula (shin bones) in the lower limb with the proximal end of the talus bone in the foot. The joint between the tibia and the talus bears the vast majority of the body's weight while the fibula keeps the talus under the tibia. The term "ankle" is used to describe structures in the region of the ankle joint proper. The joint under the ankle allows side to side movement while the ankle joint proper allows the foot to hinge up and down. Together they allow the foot to move as it were connected to the leg with a ball joint. Listed below are some of the most common pathologies written by our staff and local physicians that we see. Achilles Tendonitis is an inflammation of the thin sheath-like structure around the achilles tendon. This tendon attaches to the back of our heel and allows the muscles in the calf move our foot down so that the toes can point towards the ground (plantar flexion). The Achilles Tendon is a long and thick tendon, which moves our foot down, so that the toes point to the ground (plantarflexion). The pain can be shooting, piercing, and burning pain. The first few steps in the morning many times are the worst. It is important to treat this condition as soon as possible as it may progress to the point where it causes permanent damage to the achilles tendon proper. Ruptures and the need for surgical repair may be avoided by early diagnosis and treatment of this very common condition. 1. Overuse, such as too much running, especially up or down hill. 2. Trauma, such as a kick to the tendon. 3. Shoe or boot (ski/snowboard) pressure, especially at its attachment to the heel, or just above it. A common musculoskeletal injury in which the ligaments of the ankle are stretched, partially torn, or completely torn due to sudden over stretching. This most often occurs when the ankle is suddenly "twisted" in a sports activity or by stepping off an uneven surface. Most ankle sprains involve the ligaments on teh outside of the ankle as the foot folds underneath the body. This is referred to as an inversion mechanism. Ankle sprains are very common in sports involving rapid side to side movemnts ("cutting"), such as basketball, soccer, and tennis. Sprains are graded based on the extent of the damage to the ligament. Grade 1 Sprain: An injury without macroscopic tears. No mechanical instability is noted. Pain and tenderness is minimal. Grade 2 Sprain: A partial tear. Moderate pain and tenderness is present. Mild to moderate joint instability may be present. Grade 3 Sprain: A complete tear. Severe pain and tenderness, inability to bear weight, and significant joint instability are noted. R.I.C.E – Rest, Ice, Compression, Elevation. The best first step to this injury before you can see a doctor of physical therapist. Depending on the severity of the sprain, you might or might not even be able to walk without pain, so the best thing to do is stay off of the injury as much as possible, and see a doctor as immediately for evaluation. Once in physical therapy, common first stages of treatment are to restore your basic range of motion and reduce swelling, begin a strengthening regimen, normalize gait (walking pattern), and then begin a return to normal activities. Only after success in all these stages are patients ready to begin agility and plyometric exercises and activities that begin to mimic game and competition. This term applies to pain in the front of the leg, occurring anywhere between the ankle and the knee, usually with prolonged walking or running. In extreme cases one can have pain in this area with just standing. Shin splints usually begin as a dull aching pain in thefront of the lower leg after prolonged walking, running, or jumping. If left untreated, the pain becomes sharp and intense with all weight-bearing activities. 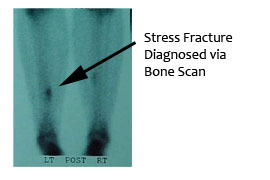 Other serious problems of the lower leg, such as stress fractures, are usually painful even while resting. The muscle in the front of the leg which usually becomes painful is the Anterior Tibial Muscle, which is encased in a thin sheath. This muscle attaches to the foot; and as long as the foot is properly aligned, the muscle functions efficiently and painfree. However, when the foot is pronated (the foot rolls outward and you walk more on its inner aspect), the Anterior Tibial Muscle twists within its sheath. This twisting of the muscle within its sheath can cause tiny tears in the muscle, or the muscle rubs abnormally against its sheath, and produces inflammation and pain. "The best treatment is prevention or early intervention." This is best accomplished by orthotics. Custom-made orthotics will realign your feet, correcting pronation; and they will provide you with the shock-absorbency needed to cure and prevent shin splints from occurring. If you have tried other methods of treatment, and they have failed, custom-made orthotics are the answer to your problem. It is no coincidence that serious amateur athletes, as well as most professional athletes, wear custom-made orthotics to keep them painfree and "in the game."